Bangalore has been experiencing unseasonal rains for the whole of last month, much like the runs raining from Shewag’s bat – unpredictable and pleasant. The Full-Moon Half marathon was also bang in the middle of a long Good-Friday weekend. The only preparation I had done for this one was to quit doing any exercise for the whole of last week. It did feel good to wake up as late as 830 every morning, barring the one morning when I joined Saurabh, my new running mate on a 13km jog on Wednesday. The run was to start at twilight from a private farm on Kanakpura road, NH209. About 10kms from Metro (Kagalipura? ), there is a gate that leads into a long and winding up a hillock to the guest house on top offering a decent view of the topography of the place. A beautiful place to own – some 45acres of coconut grooves + the hillock to house the resting place – perfect I say! Saurabh and I were the last of reach there and we missed the flagging off. We caught up with the others quickly. 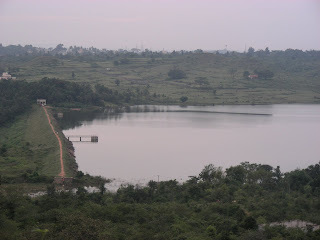 It wasn’t really a trail, mostly very undulating winding road passing through a village and opening into this beautiful Vaderahalli lake and then into some wilderness behind the lake. The pit stops were sufficiently stocked with watermelons and oranges. I finished the first loop in 53mins, but with no moon to light up the road, it was quite a challenge to do negative split timing. I had to butter-foot the last couple of kms and finished an impressive 5th overall, just behind Athreya, Ashok, Hari and Saurabh. The worse was yet to come… we were deprived of the much-needed chilled, bubbly nourishment (read B E E R) at the end of the run. “We didn’t tell you to run that fast”, was the explanation. Got back home – high and dry by midnight. The photos, courtesy Abnash can be found here.